The Spring District is starting to sprout. Wright Runstad & Co. has built several new streets and utilities for the first phase of the $2.3 billion project, and Security Properties is getting ready to start the first of its five apartment buildings. Wright Runstad's Greg Johnson gave the Buzz a tour last week. 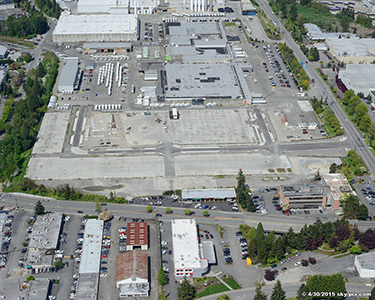 Much of the concrete slab from the old Safeway distribution center remains, but new roads are in place and construction has started on a central park. Crews were cutting into the slab on the site where Security Properties will build its first Spring District apartments. Once the slab is removed, crews could start excavation for an underground parking garage. The narrow roads and short blocks are more Seattle style than downtown Bellevue. Johnson said he wants to retain some of the site's industrial character, and make the Spring District look more like Pioneer Square or Portland's Pearl District than South Lake Union. Roads have been built on the south end of the site for first phase of the Spring District, while warehouse operations continue on the north end.